2018 is wrapping up and the holidays are right around the corner. Holiday sales are skyrocketing each year. As a small business, this time of year is extra important because it’s when most people are in an extra spending mood. The many special days during this time a year such as Black Friday, Cyber Monday, Christmas, Hanukkah, and New Year’s are all reasons to celebrate and spend money. Whether you’re a brick and mortar store, an online store, or a freelancer, anyone in business can benefit from a little holiday patronage. There are a lot of things you can do to capture the magic of the holiday season for your bottom line. If you’re looking for a place to start, how about right on your website with some solid holiday search engine optimization tactics? Did you know about YouTube and Google? Google owns YouTube. Therefore, YouTube videos are served up on Google’s search results in tandem with related websites. Take advantage of this fun fact by creating a few holiday themed videos specifically geared for Google’s search engine. If you own a retail store, do a walk-along and share some of your special deals. Title the video accordingly and don’t forget to include the name of your city. For even more value, target specific types of gifts whether it’s for Dads, Children, Grandparents, Bosses, or Gifts Under $10. If you provide a service, try and tie in a holiday themed how-to video related to your service. When posting your videos to YouTube use the proper tags within the platform as well to categorize your content so that they’ll show up on video streams of YouTube users as well. Holiday Tags are not just for gifts. Don’t forget to update meta descriptions, title tags, and image attributes. These small details can make a huge difference when it comes to showing up on search results. Ask your webmaster to include holiday specific tags throughout your website. Don’t use random terms. Be specific and use terms that your ideal customers would be searching for. That way, the search engines will pick them up and serve your site to those searching for those same terms. Pictures are worth more than just 1000 words when it comes to good SEO strategy. Pictures can be worth 1000 website visitors as well. With any new content you create for the holiday season, be sure to include pictures. When posting pictures to your website, it would be very beneficial to include holiday specific terms within the titles and alt description tags. Doing this allows search engines to recognize your pictures as well which gives you more bang for your SEO efforts. Write blog posts with a holiday theme. Whether it’s a gift guide, or how to beat the stress during the holiday season, write something about the holidays that relates to your business in anyway. To be even more specific, try attracting local search traffic by listing where the good sales are in your area, toy drives, or even where the holiday volunteer opportunities are in your area. Are you hosting any holiday events? This would be a good opportunity to write a blog post about that. Use holiday specific keywords in all of your blog posts starting now to bring in holiday search traffic to your website. 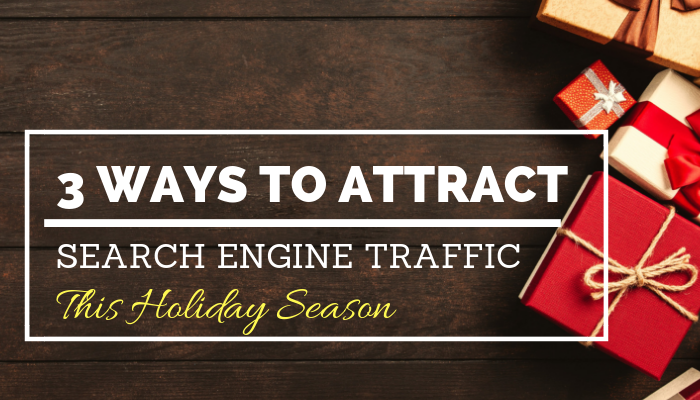 Even though it’s the end of the year, you can still do a lot to attract search engine traffic to your website especially with the holiday season fast approaching. Although, it may take some time to implement, the tips in this article are fairly easy to execute, and the benefits are exponential. Take the time to put in this SEO work on the front end so you can enjoy great results on the backend. If you’re not into SEO, we can help. Schedule a free consultation with our us and we’ll show you how.